And we've made it, once again, to Friday. Woot! The weekend lays ahead of us. If you're lucky, you've got some gaming scheduled. That's what I'll be doing. In the meantime, we've got our regular set of bite-sized gaming stories for you. On the platter today we have: Sine Tempore Coming To Kickstarter, Devil's Run RPG Coming To Kickstarter, Unit Reference Cards for Combat Patrol Napoleonic Skirmish Released, Raging Heroes Releases Toughest Girls of the Galaxy Heavy Weapons Teams, Board Game Beaver Interviews Anne Pätzke, Brother Vinni Releases Robotic Dog, Kromlech Weekend Promo Happening Now, and Dreamchaser: A Game of Destiny Coming To Kickstarter. Woo! We've made it, everyone! At least for me, it was a nice, calm, "standard" week. As a creature of habit, I'm very grateful for that. Many of us here in the US are also getting a 3-day weekend, what with Martin Luther King Jr. Day being this upcoming Monday. So that's cool. I hope you have some cool weekend activities planned and that today being Friday the 13th doesn't mean anything bad for you. But as we go into the weekend, we should stock up on bite-sized gaming stories. Today we have: New Ruler Designs From Kromlech, Cryptozoic Releases Mighty Meeples: DC Justice League Collection Tin, New Aufklarungs Passenger trays from Dark Art Miniatures, New Warbikes and Trikes from Raging Heroes, Rebel Minis Releases New 28mm Sci-Fi Packs, Cardstock Warriors Site is Live, Weekend Promo from Kromlech, and New Bases Available From Micro Art Studio. The Gateway to the Weekend is once more upon us. In just a couple hours, we'll be enjoying a couple days off to do whatever we want (hopefully that involved gaming). We'd best make sure we've got enough strength. That can be gained by noshing on some bite-sized gaming stories. Today we have: Viking Raid and Shaleground Flat Bases Now Available From Tabletop-Art, More busts released by Shieldwolf Miniatures, Raging Heroes introduces the Davidians sculpts, Happy Seppuku Texture Presale Happening Now, New Sci-Fi/Modern Minis From Rebel Minis, Barbaric Splendor Kickstarter One - Personalities is now live, RN Estudio Unlocking Stretch Goals In Revenants vs Ancestrals Indiegogo Campaign, and ThunderChild Miniatures Remasters and Releases Gnarly Pilgrims Minis. The week continues on. We've made our way to Wednesday. Hopefully the first half of your week has been drama-free (unless you're, like, a thespian or something). It's that time to fuel up on some bite-sized gaming stories so we can get through the last half of the week and get back to the weekend. Today we have for you: Assault Publishing Transparent Bases Now Available, Mitosis Miniatures Posting New Rat Rider Previews, Red Panda Miniatures Announces Kickstarter Launch Date, New Release Available from Klukva Miniatures, FAITH: A Garden in Hell Reaches Funding Goal, Last Week for Capitalism on Kickstarter, and Toughest Girls of the Galaxy "I Want Them All" Box #8 Now Available. We once more stand on the precipice of the weekend. I hope you've got gaming stuff planned. I know I do. It'll be a good time had by all. Lots of gaming, and then lots of reporting about said gaming back to you all. But I'm still getting over being sick. I'm hoping I'm on "the last day" of this nonsense today. But just in case, I'm keeping up my "being sick" protocols. And I'm also going to need to fill up on some bite-sized gaming stories. Good thing that's just what I've got here. Today we have: Askari Miniatures Webstore Back Open, Hitech Miniatures Releases Battle Walker "Onslaught", New Toughest Girls of the Galaxy Box Sets Available From Raging Heroes, Sally 4th Pulp Alley Character Cards released today, Oddzial Osmy’s 3mm and 15mm May Releases Arrive at PicoArmor, and Kromlech New Release: Legionary Heavy Flamers. We're making our way through the week here at a steady pace. It's already Wednesday. I hope it's going smoothly for you. It's been naturally busy the first couple days after the Expo. I'm mostly caught up. Just a couple things left. But at the exact moment, it's bringing you some bite-sized gaming stories to chew on. 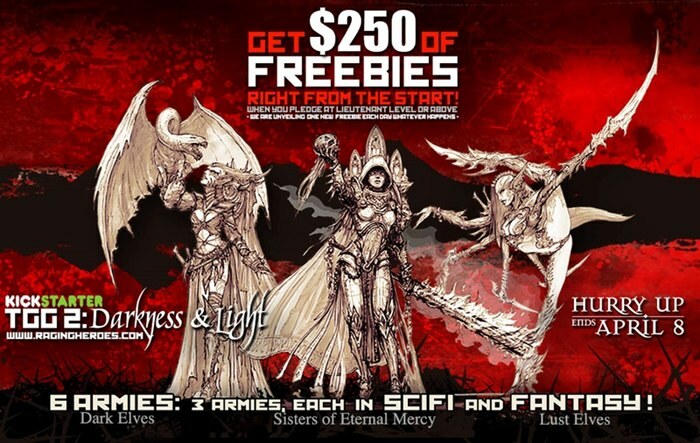 Today we have: Siren Miniatures Posts New 3D Render, Gamer Badges Up On Kickstarter, Battle Valor Games 15mm Fantasy New Releases, 28mm Northern Raiders On Kickstarter, Symbaroum on Kickstarter June 2016, New Legionary Vibro Scythes From Kromlech, Warhammer 40k Tactical Objectives App 2.0 Update, Khurasan releases 15mm E-25 Jagdpanzer, Raging Heroes new TGG model available: Nertha, Dragon Head Coin Series Is Back on Kickstarter, Scotia New Releases - May 2016, and Kickstarter Video Posted for Hope board game. We're making our way through the week. It's Wednesday and it's time for some bite-sized gaming stories. Today we have: Mekawing Z 1.9.5 released in English, Selina Special offer By Battlegate Games, MidKnight Heroes opens up back end pledges for the Super Chibi Kickstarter, The Argyle Frigate Miniature is now Available for Legends of Kalidasia, Raging Heroes Releases Nepharya (NecroPriestess), Tabletop-Art Previews Space Dungeon Round-Lip Bases, Counterblast - free Beta Rules Posted, Heroic Scale Female Heads 2 available to Pre-Order now From Statuesque Miniatures, Bad Squiddo's Women of the Red Army go on Pre-order, and Final Week for Twisted Kickstarter. Well, winter is almost technically over. Just a couple weeks left. Here in Atlanta it's already started to get rather nice outside. But that doesn't mean we can't focus on gaming. Raging Heroes is here to help with that with a sale going on right now in their webshop. It's cool to see companies that, when I started, were just very small, or some that didn't even exist, grow into brands whose names have some very cool products to them. Such is the case with Raging Heroes, for example. And this year they're having their first ever Black Friday sale. 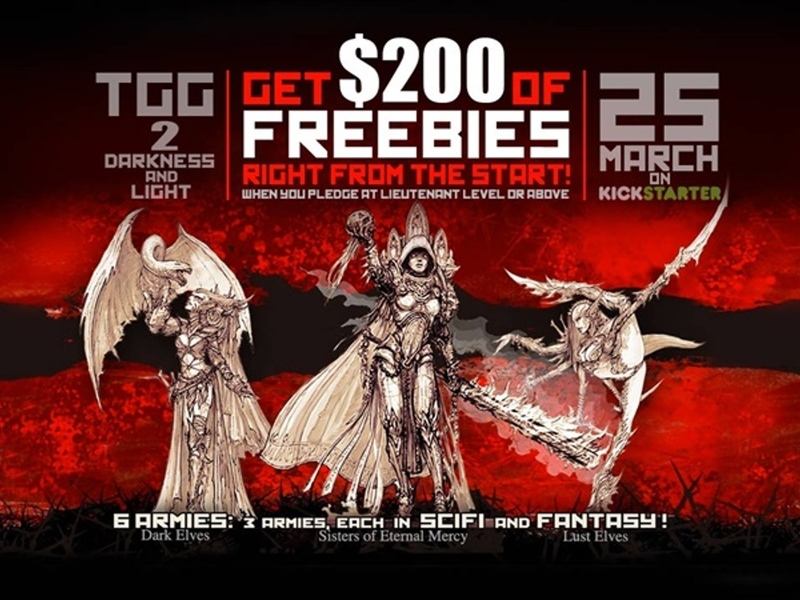 Raging Heroes is looking to unlock some more minis for their Toughest Girls of the Galaxy 2 campaign. "But, that Kickstarter's been over for quite some time now!" I hear you say. Well, just because the Kickstarter is over doesn't mean that the funding is and that there's nothing else to be unlocked. 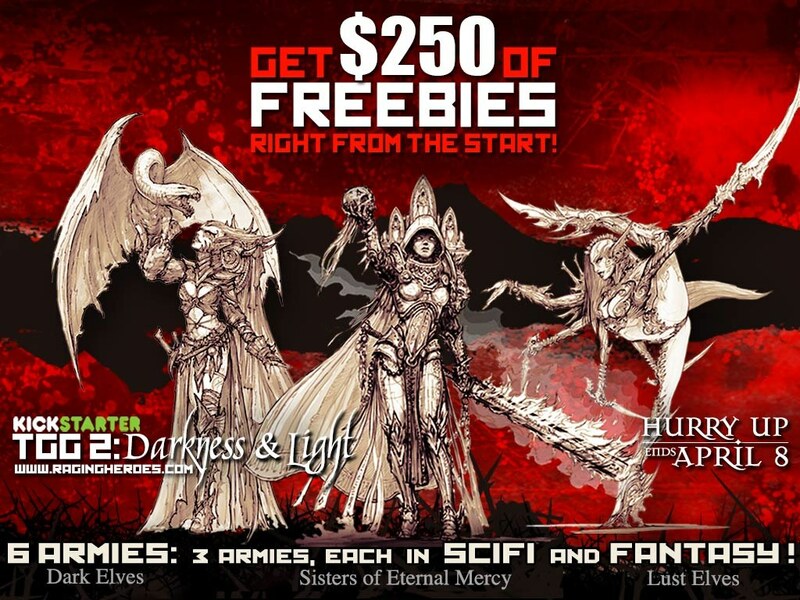 They're currently looking to unlock the Dark Elves Sorceress by getting people to share the photo from their Facebook page. They'll unlock both the sci-fi and fantasy versions. 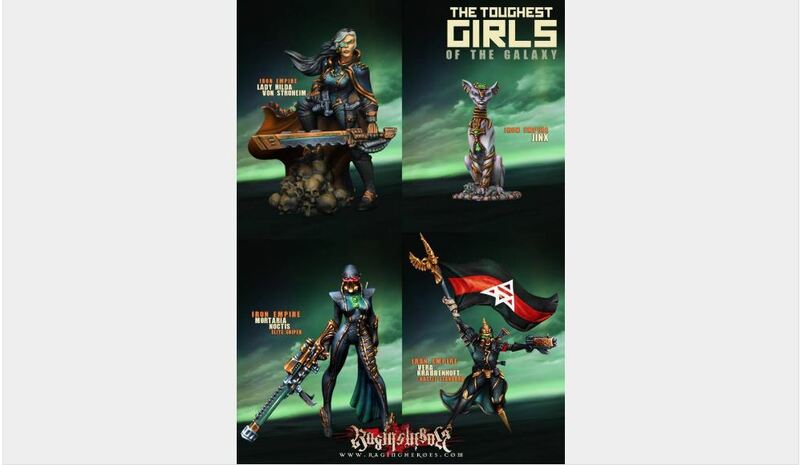 Raging Heroes is in their final hours for Toughest Girls of the Galaxy II over on Kickstarter. They've made it over $730k for the campaign, with lots of stretch goals broken, giving you more add-ons available as well as freebies thrown into your pledge package. They're also updating the status of Wave 3 shipping for their Toughest Girls of the Galaxy 1 campaign. Things have been going more-or-less smoothly, though there has been a hiccup with one particular model. 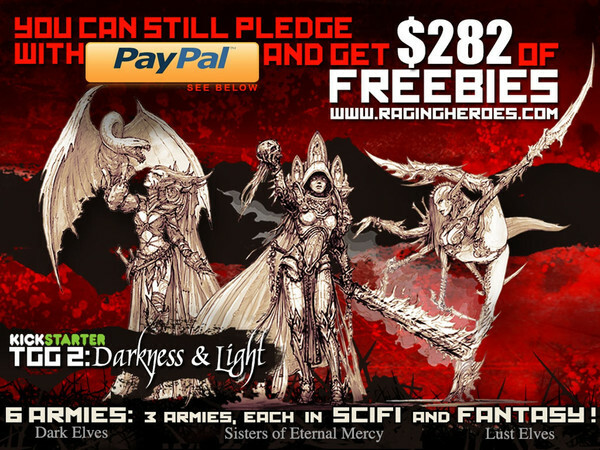 Raging Heroes has added in a PayPal option for their Toughest Girls of the Galaxy 2 campaign. It's not on their Kickstarter page (of course), but it's over on their regular website. And if you want to get in on the campaign, but can't for some reason right now, you can pledge via their website version until the end of the month. 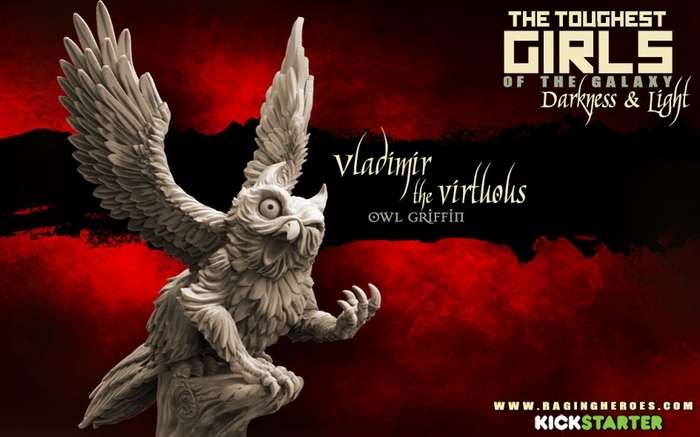 The pledges through their Kickstarter and their website tie in together for stretch goal unlocks. 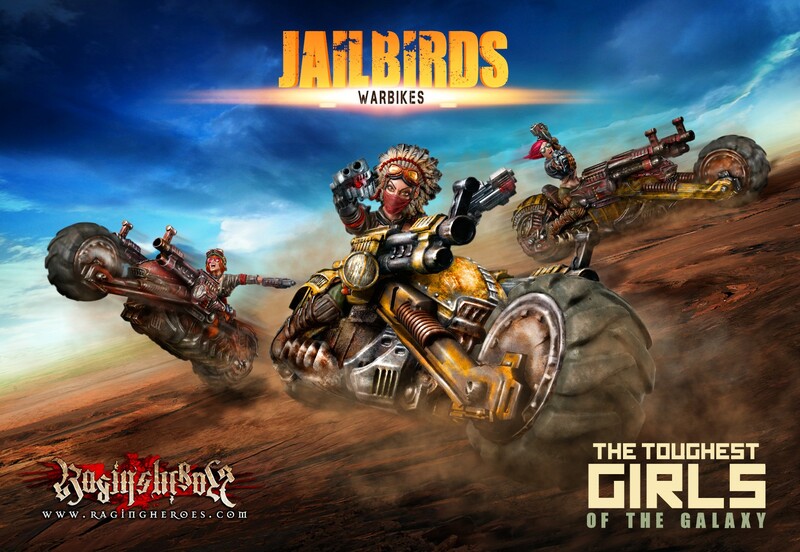 Raging Heroes has added a new pledge level to their Toughest Girls of the Galaxy. You can now get the Eminence package. It's $1,500, but you get over $2,475 worth of minis. There's also new freebie unlocks available. The campaign has 5 days left if you want to get in on the action. Also, a reminder that not all the artwork could be considered safe for work on their campaign. 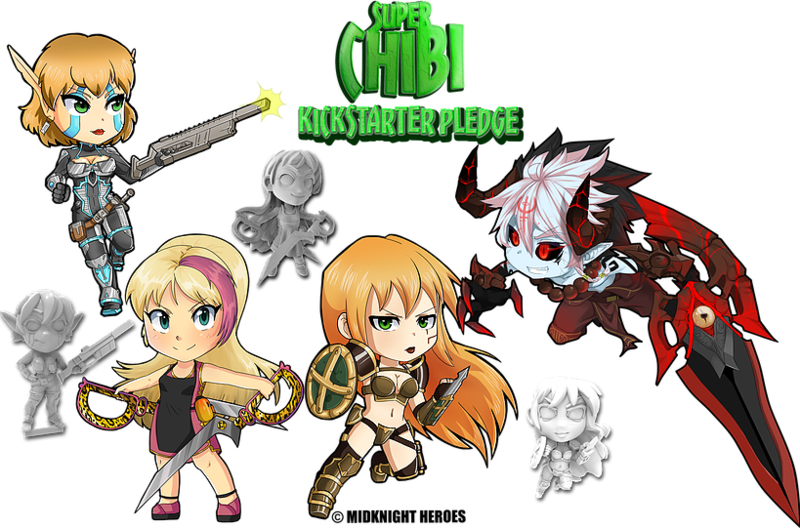 Raging Heroes once more takes to Kickstarter with a Toughest Girls of the Galaxy Kickstarter campaign. This time it's Light and Darkness, as they have 6 new armies. One of the armies are the Lust Elves (so be warned if you're at work and want to peruse the campaign). The campaign funded right away and has already funded several times more over (with it continuing to rise rather quickly at time of posting). So, like before, there'll be stretch goals broken aplenty. 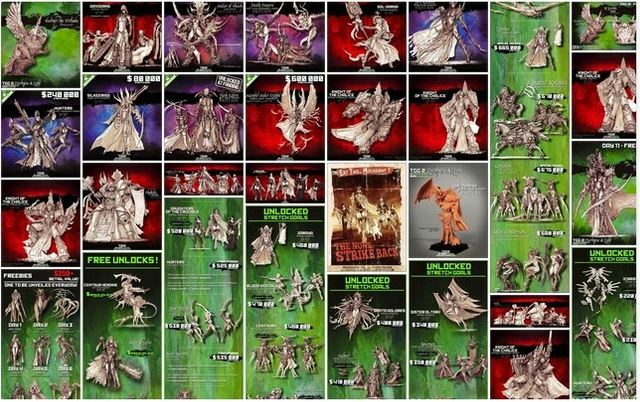 An interesting aspect of this Kickstarter is that the armies have both sci-fi and fantasy styles, so there's a larger group of gamers who might be interested in checking out what's on offer. Raging Heroes has announced that they'll be starting a new Kickstarter campaign on the 25th. Now that the Toughest Girls of the Galaxy has been handled, they're moving on to the Toughest Girls of the Galaxy 2: Tough Harder (ok, that's not really the sub-heading. I just made it up). These will be light and dark elf miniatures. 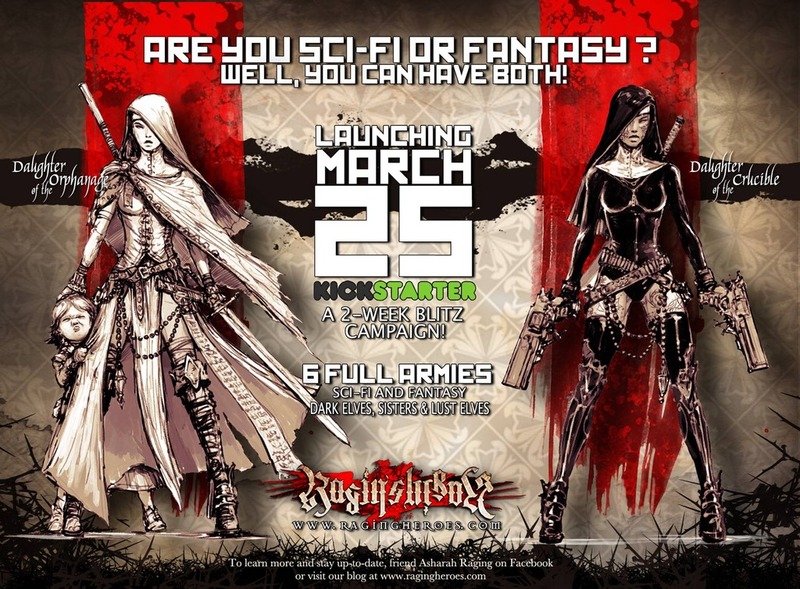 The difference this time is that the campaign will encompass both sci-fi and fantasy versions of the miniatures. So whether you prefer your swords to be laser/chainsaw variety, or just the standard "sharp piece of metal," they have you covered. 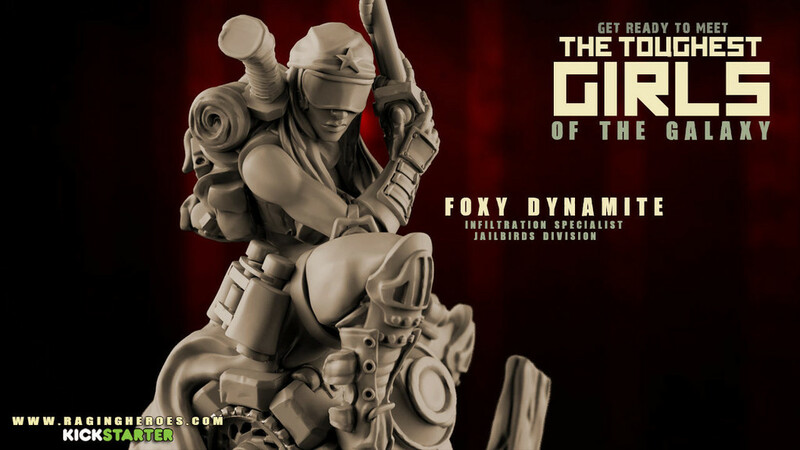 Raging Heroes continues to bring out more models from their Toughest Girls of the Galaxy line over in their webshop. 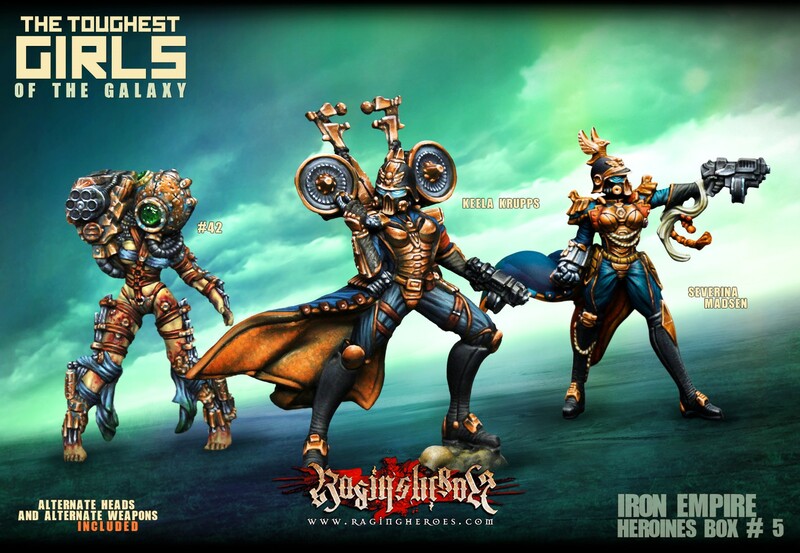 The first Iron Empire heroes are now available. And because they're so kind-hearted and in the spirit of giving this season, they've got some special deals over in their webshop, too, if you buy them as a bundle. Plus, you can get a free beer coaster with certain orders. Because why not?